I guess a disclaimer is definitely needed for this one. 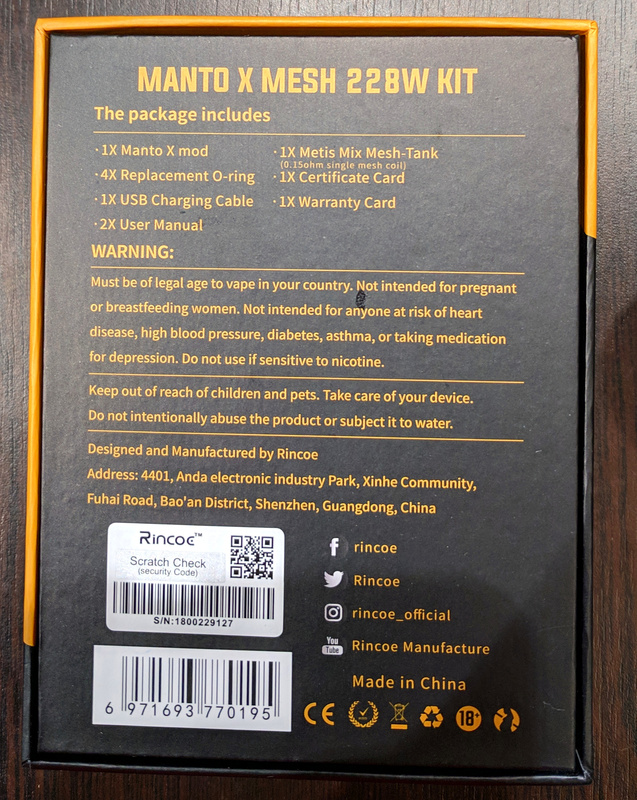 This kit was sent to me by Rincoe for the purpose of this review. Despite this fact I will keep the review as honest and impartial as possible. How shall we begin this story? Not a long time ago I was on facebook, and I saw this post where Rincoe was looking for testers and reviewers for their products. I thought it’s just another competition/giveaway, but unlike the current trend, I didn’t have to re-post anything, or tag anyone. All they wanted was for me to fill out a form on google docs. That was a rather painless process (there were perhaps two or three questions there). Literally an hour after I filled the form out I got an e-mail from Rincoe marketing department, asking me for a shipping address and phone number. 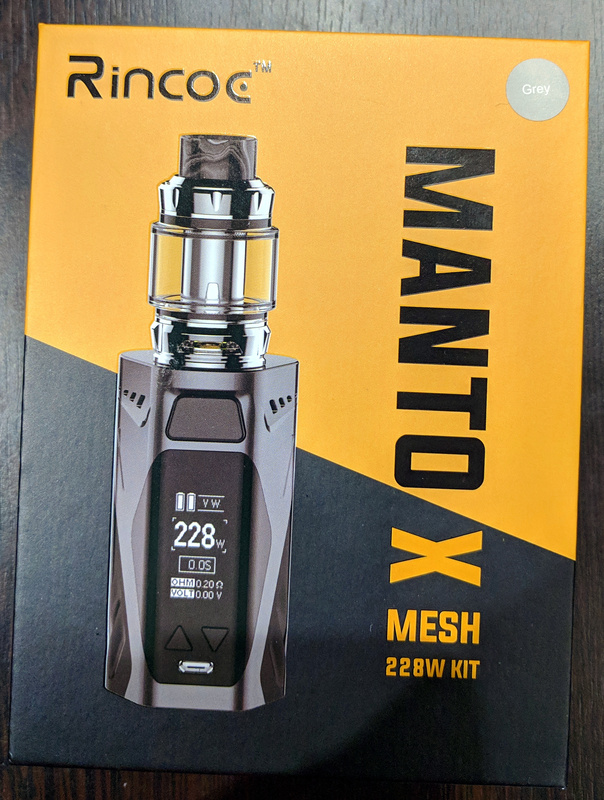 Four days (and a few emails later) the package was delivered (almost to my doorstep) and I became a proud owner of a brand new Rincoe Manto X kit. The kit arrived in a pretty Orange/Black fox (that states that it’s made of recycled materials so kudos for that one). Inside the box was the mod, the tank, an elongated cardboard box with the USB cable and extra o-rings, and a plethora of paperwork (battery safety card is a nice touch). I did notice the distinct lack of a spare glass for the tank, or additional coils (we will get into this one a bit later). The other side of the box had all the usual information, including a scratch-off authenticity code (unlike another mod I reviewed). Judging the box, the kit I received is an actual production kit, and not a pre-production sample. Since this is a kit review, let’s start with the tank. 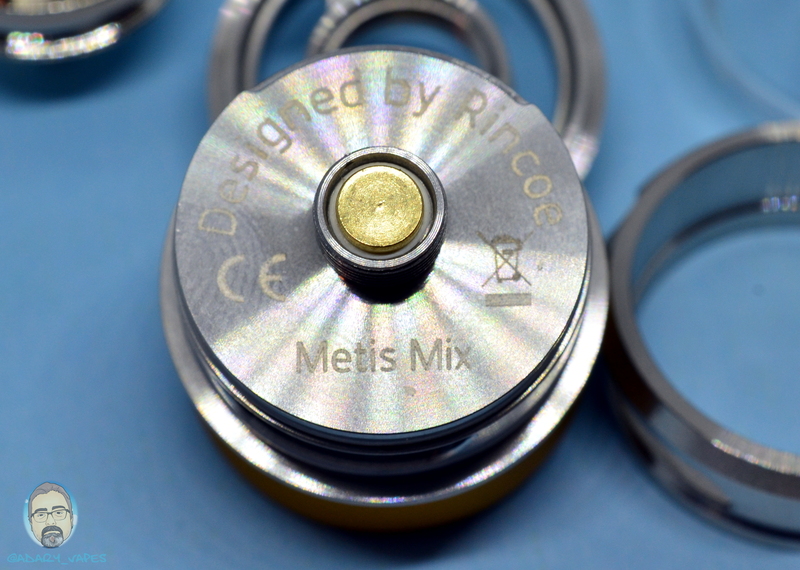 Rincoe Metis Mix tank that came with the kit was outfitted with a 6ml capacity bubble glass, and the 0.15ohm Kanthal mesh coil was pre-installed. 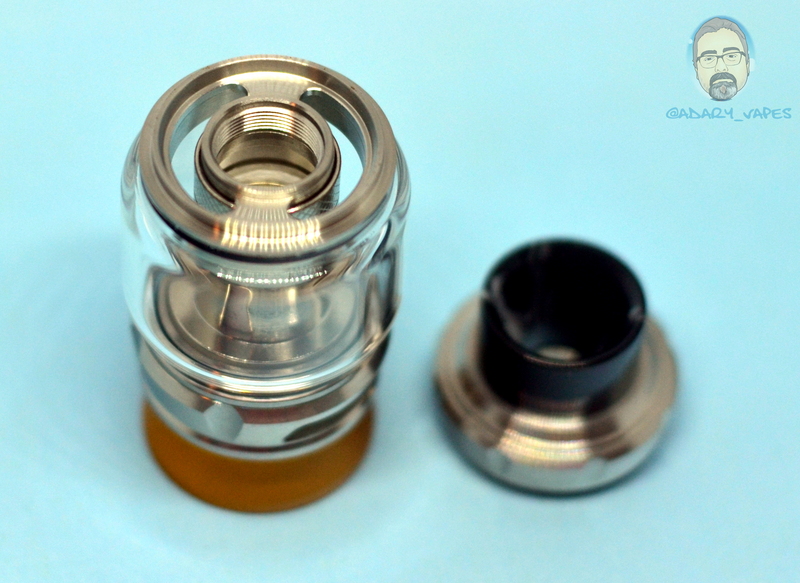 Tank construction is stainless steel, and it features a twist off top cap, and a hefty knurled airflow ring in the bottom. 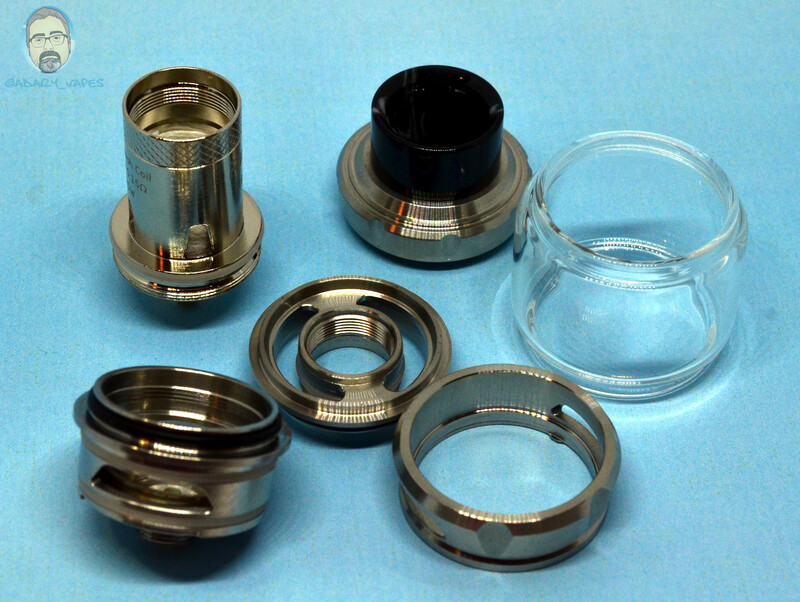 The drip tip supplied with the tank is a resin 810 drip tip, with two o-rings on the drip tip itself. Curiously it has the same inner lip like the resin drip tip that came with the Geekvape Alpha tank. Under the top cap are two very long kidney shaped refill ports, which are just a bit too narrow for my taste (feels a bit awkward when refilling from a thick 120ml unicorn bottle). The airflow ring in the bottom has a stopper, and a great feature of this tank is that the airflow ring can be easily removed for cleaning. 510 center pin is gold plated, the machining on the tank is superb, all threads are clean, and all edges are smooth. Save to say, it’s a very solid piece of kit. How does the tank perform? Like an absolute champion. 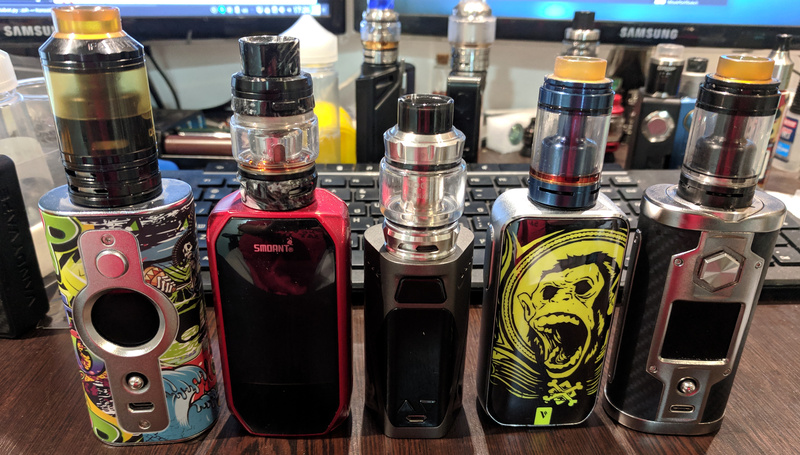 I have to admit that I have a rather limited experience with sub-ohm tanks, and most tanks I tried in the past either leaked on me or had a special assembly trick to make it stop leaking. Nothing of the sort with the Metis Mix. First thing I did with the tank was to take it apart for a light cleanup. I re-assembled it in the standard fashion – screwed the coil into the deck, primed the coil with some juice, added the glass, and closed it up. With some other tanks I tried this would have resulted in an instant leak due to loss of vacuum in the connection between the chimney and the coil, but this tank held up like a champ. In fact, it absolutely never leaked on me. Each refill was done with the airflow ring open, I never rushed to close the top cap, and yet the tank just wouldn’t leak on me. Metis Mix tank has absolutely enormous airflow. With the airflow ring open, I can literally take a whole breath through the tank without feeling any restriction. The airflow ring has only two ports, but they are huge, and easily adjustable for preferred airflow, I kept it about 2/3 closed since I do like slightly restricted DL airflow, but it was a bit noisy at that setting. Flavor wise, I had a very pleasant surprise. After the cotton in the coil soaked up the juice for about 10 minutes, I gave it the first puff at 40 watts ( lowest specified wattage on the coil) and I got a thick-ish cloud with noticeable flavor, Every few puffs I bumped it up a few watts, until I hit 55w which seems to be the sweet spot for this coil (at least for my taste buds). I tested the tank with a rather sweet lemon-anise mix that gives stellar flavor in my RTA’s and drippers, and I have to say that at 55w, Metis wasn’t far behind with the flavor. 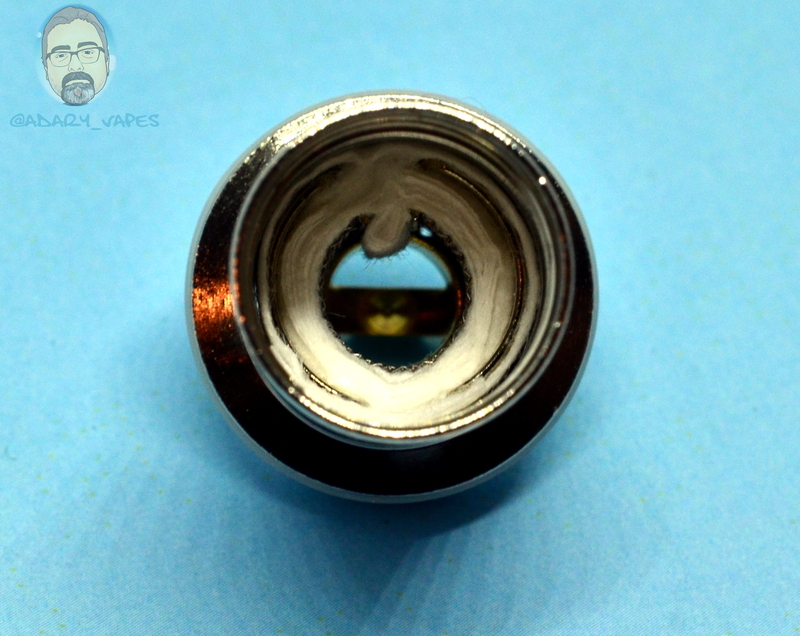 Another great feature was the coil longevity. I always had bad luck with sub-ohm coils, burning out on me rather quickly (after about 30-40ml of juice). I vaped a grand total of 90(ish)ml of juice before the coil even started giving first burned-out signals. Once that started, I took the wattage down to 50, and enjoyed another 15(ish)ml of juce before the coil became completely unusable. The only complaint I do have about the tank (well the kit) is that it came with only one glass, and with no spare coils. Having a few more spares would have been a great addition. And let’s take a look at the mod. It took me about half an hour to come up with the opening sentence that would describe the mod. I don’t want to sound like I’m biased, and I promised a fair and unbiased review. After the week I spent with the mod, I just love it! (yes, it has cons, and we will mention them as well). 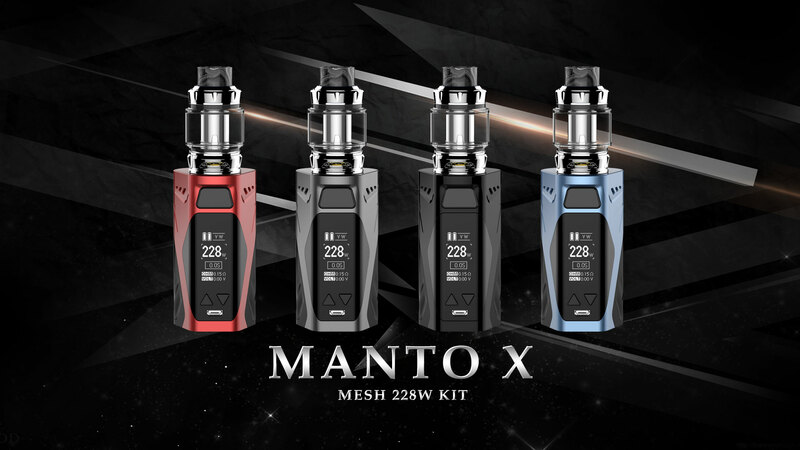 Before I held Manto X for the first time, I was convinced that the smallest dual battery mod is something like Vaporesso Luxe, or Smoant Naboo, or even my g-class or the Vsticking, but compared to them, Manto X is tiny! In fact, it’s barely larger than my small single battery mod! I can almost conceal it in my hand (and I’m know to have hands that are not much larger then the hands of the reigning US president). 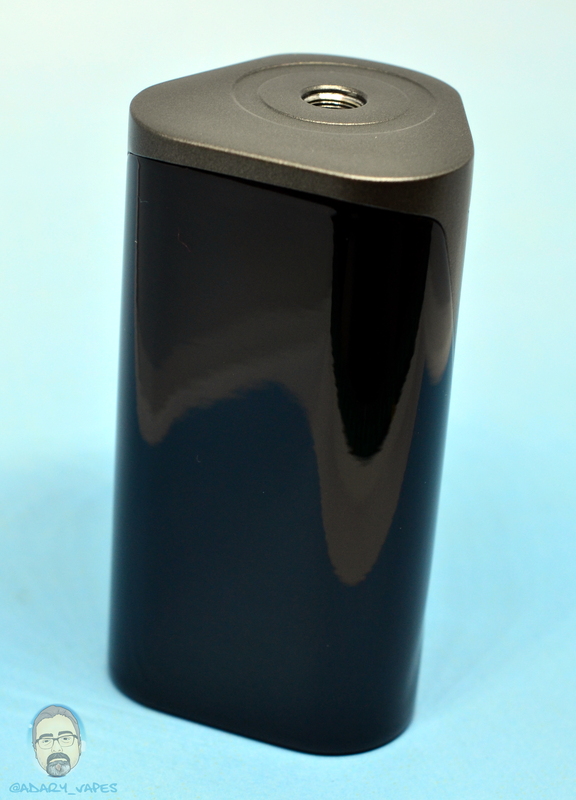 On the other hand, the construction of the mod allows it to have absolutely no overhang with a 30mm tank mounted on it. Another feature that I absolutely loved about the mod is the fact that it has a very simple B&W screen. I can understand that some people like big color screens, loads of features that have nothing to do with vaping, but what I’m looking for in a mod is pure function. Maximum battery life and simple menu system. The mod construction is zinc alloy, and plastic, and the plastic parts are my first con for the mod. They look super pretty until you touch them. The two large shiny surfaces are a huge fingerprint magnet, and I know a few people who care for things like that. I personally don’t care too much for the looks, but it would have been nicer if the mod was completely matted out. The up and down buttons under the screen seem to have switched spaces, left being up and right being down, but this is not a big deal since they are triangular and point in the direction of operation. The large power button above the screen is clicky, has very good response, but it also rattles. 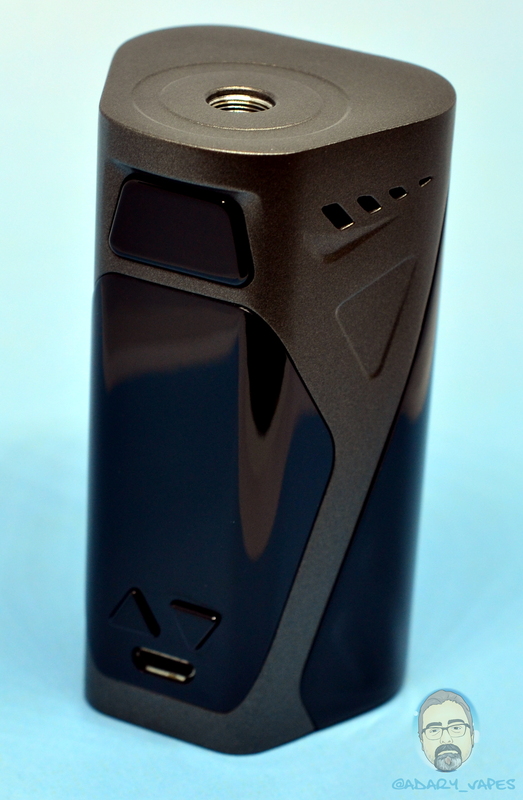 When I first started testing the mod, I used it for three days straight with the Metis tank that came with the kit. I used it mostly at 55w, and the battery life was really good. I measure battery live by whether I need to change the batteries when still at work (so very scientific of me). I usually leave the house around 9am, go to work, and come back home by 8pm. As long as I staid on 55w operation, I would come back home from work, and still have some battery life left before having to replace the batteries. For me that is stellar battery life. 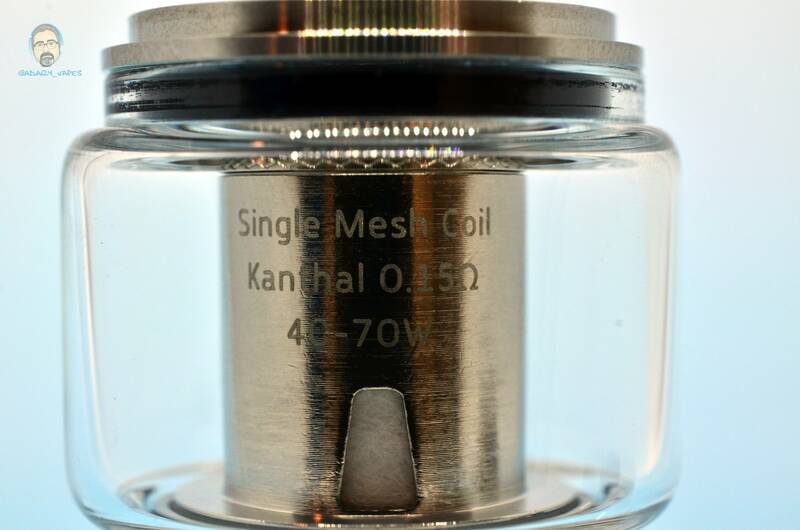 The mod also fires quickly, and of course the Kanthal coil has very short ramp-up, and the vape that it produces is great from the very first puff. Second part of testing was my all time favorite temperature control. After the provided coil went completely kaput, I switched to my Aromamizer Supreme V2. The build was a dual space staggered coil, all SS316L wire, measuring at 0.1ohm. I have to say that I wasn’t impressed by the TC performance. 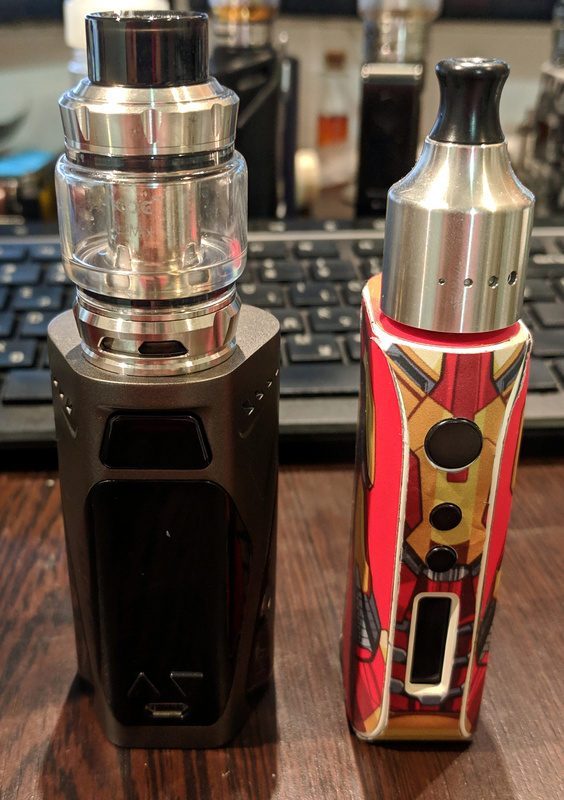 I did get vape, and I did get decent vape, but the preheat and temperature settings were completely different than what I would set on my other higher-end devices for the same tank and the build. I kept the preheat at 95w, and only at around 540F I started getting vape that I would expect to get on other mods with 80w preheat and 480F setting. Needles to say, I was quickly back to wattage mode where I really enjoy using this mod. Even with a chunky SS316L coil it fires very quckly, and the VW mode overall feels very accurate. So how can I summarize this kit? I have to say that it’s very good. The tank is good, it has decent flavor, and the mod is in my opinion excellent. The small size and battery life for compensate the lack in TC performance, and I can easily see this mod becoming my daily driver when outside the house. Would I replace this mod and tank if damaged or lost? I would definitely replace the mod. 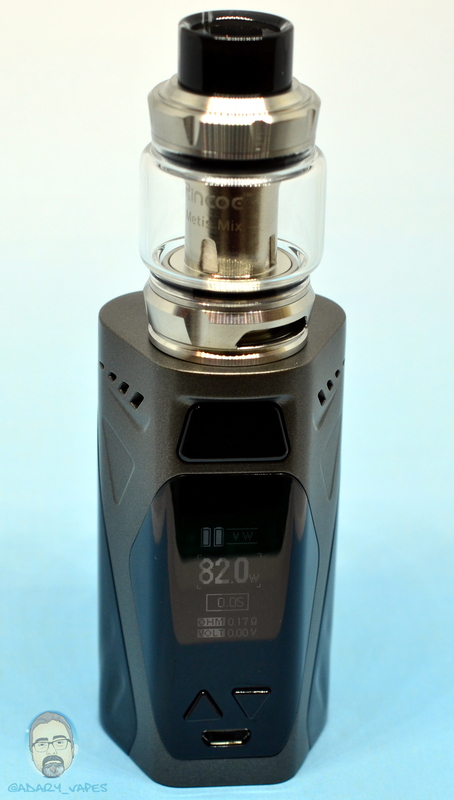 Not really sure about the tank (I am an RTA snob after all) but the mod is a definite winner for me. Thank you for the review, @adary . Too bad about the tc, though. Nicely done @adary and it’s NEVER a bad time to toss a Steam Crave into the mix !!! NEVER a bad time to toss a Steam Crave into the mix !!! Merry Christmas and thanks for the review! So close to it… I had to do a double take. And inspect it. @adary Thanks for your review! Very Nice. I thoroughly enjoyed that review sir.